Peter and Kristian came past the house to pick me up at the unearthly hour of 0540 as we were heading off on the 0630 ferry from Stromness. We met up with Kate on the ferry and were on our way. The girls headed south in one car with the lads in the other, stopping at Capaldi’s for ice cream! Next stop was at Kate’s friends house, where Kate had stored her boat and the two boats Peter and me were renting from the Inverness club (which Kate had kindly arranged!). With them safely strapped on the cars we headed to Tiso in Inverness. Kristian thought about, but resisted buying a Pyranha Stretch and we had some lunch. Me and Peter were discussing that we were going to paddle the middle Findhorn with one of the lads working in there, who started to put the fear in me by telling me about rapids called Dragon’s Teeth, the Wall of Death and Elephant Hump! On that note it was time to head to the bunkhouse in Aviemore, where we had a dorm booked. After some difficulty with keys we got trusted with a master and settled into our dorm. The facilities were really good, complete with drying room, which came in very handy! After we were all checked in at the bunkhouse, we headed to Logie Bridge, the get in on the Findhorn. Kristian and Kate were each paddling their own boats while I paddled a Pyranha Storm and Peter paddled a Pyranha Stretch, much to Kristian’s envy! 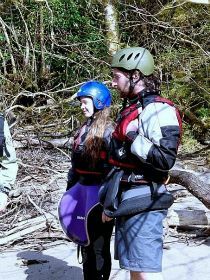 We got all kitted up and ready to go and by this time I had the fear! 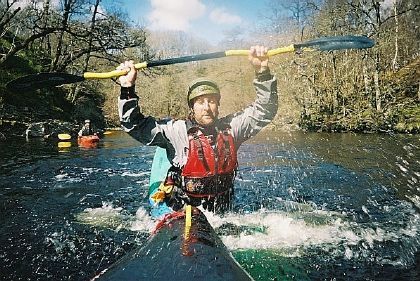 I had only paddled three rivers before and that was back in September 2007 and the only paddling I had done over the winter was in a swimming pool, which is not quite the same! Anyway, we got in at Logie Bridge and paddled the middle section getting out just before Randolph’s Leap. This section of river is grade 2/3. Once I got on the river I really enjoyed it. There was a good amount of water although it was a tad on the cold side! Kate led as she had paddled this section quite recently with the Inverness Club. Kristian stayed at the back to keep an eye on Peter and me and between him and Kate I felt well looked after. I tried to follow the line Kate was taking but I am not sure I always managed to do that very well, but I got down the river none the less. The river was a bit different from the ones we did last year. It is really twisty turny and it was interesting doing rapids that turn a corner, some of them quite sharp! There were loads of rapids I grinned going over (in part because they were really good fun and in part because I was amused by Kristian singing at the top of his voice! 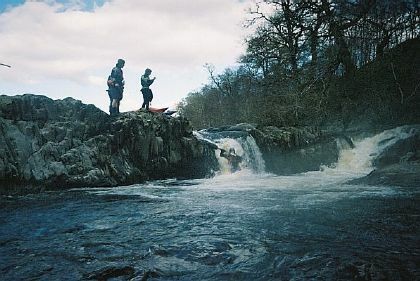 ), some I found myself going “Oooo” over and I had the odd wobbly moment but I managed to get down the river the right way up, as did Kate and Kristian. Peter capsized twice but rolled both times which was really good. The first time was near the start and the second was a tricky little rapid on a corner and one of my wobbly moments! But we all made it past Dragon’s Teeth and the Wall of Death quite successfully! This was a lovely picturesque river and a nice paddle. I felt a good sense of achievement at the get out and Kate and Kristian were both really encouraging towards Peter and me. Two paddlers were about to paddle Randolph’s creek so we stuck around to watch. The first one made it through the rapid very successfully but the second, not so much! He came round the corner and had a bit of a crash with a rock that made all of us go “aaoow” in chorus, then he capsized, rolled and went into the cauldron, but washed out okay. It didn’t look like the most comfortable paddle ever but he was fine! We got ourselves changed, Kristian and me waited while Peter and Kate did the shuttle run to get the cars, and then back to the bunkhouse. We hung all our stuff in the drying room, got washed up and headed to an Indian Restaurant for a well-deserved meal. A drink or two in the pub next to the bunkhouse rounded the evening off nicely. Peter opted for unusual pub drinks, which just added to the humour of the evening! We left at closing time and headed back to our dorm, trying not to wake Kate, who had gone to bed a bit earlier. I wasn’t sleepy at all so teased Peter that I would stay awake watching him sleeping. He didn’t look so impressed with the idea so I decided it would be better to just to turn the light off!! We had set our alarms for 0830 but me, Kristian and Peter all woke up a while before that so got up, leaving Kate to sleep on. We had some breakfast then went for an early morning wander that conveniently led us to quite a nice kayak shop in Aviemore at opening time! We had a lovely browse around in there and after a while Kate phoned feeling deserted, wondering where we were. She joined us for a while, some money was spent on peedie bits and pieces and then we headed back to the bunkhouse to gather our stuff together ready for another day of paddling. We headed west and gathered at Roy Bridge, meeting Steve and Liz, who paddle with the Napier University club and had driven north to paddle the rest of the weekend with us. I paddled the Garry with them last September at the Wet West Paddle Fest. We got kitted up, shuttle runs done and heading down the hill, dragging our boats to the get in. The Roy was the first river I paddled, last September, but this time we all managed to get in the water without Kristian launching a boat without a passenger! The river was quite low and there were one or two rocks in the way. I was all nerves again so Kristian suggested I do a roll at the top of the river, just to give myself some confidence. It was a gorgeous sunny day so I thought I wouldn’t get a better chance so I did an Eskimo roll and got up first time, but then could barely breath because the cold of the water hit me! Thank goodness for wet suits! This was the first time I have ever done a roll outside the swimming pool though so I was chuffed to pieces with that. It feels different with the buoyancy aid on too, but did settle my nerves nicely as I was no longer scared of getting wet! Kate led as again, she had paddled the river most recently. Liz capsized and swam coming over a rapid pretty early on and sat on a rock in the middle of the river clutching her arm. We got her boat and paddle then all got out of our boats and headed to help her. After a few minutes she seemed okay again so off we all went. This river is mainly grade 2 with an occasional grade 3 rapid thrown in for good measure. Liz had another swim a bit further down the river but got straight back into her boat this time. When we got to the Roy Bridge we stopped for a peedie break to stretch our legs. The next rapid was a bit longer and grade 3. Kate told us a story about the last time she paddled it a couple of weeks previously, when a lass had gone to the left of a rock, capsized and come up bleeding so Kate had gone to the right and gotten pinned and needed a throw line to pull her off the rock. This story made me a bit nervous and I kind of wished she had saved it to the bottom of the river! On the way down, Kate broke into an eddie, so I went in beside her. She pointed out the rock, and we had just passed it! I was expecting worse and waiting for the tricky bit. Kristian came past us asking if that was it so must have been thinking the same. All six of us managed it no problem. It was actually a good fun peedie section. Then we paddled on to where the Roy joins the Spean. It was still lovely and sunny, to the point it was difficult to see because of the glare of the sun on the water. This river is totally different from the Roy as it is much wider and has a completely different type of rock. The river was ridiculously low so we spent loads of time punting over rocks which as pretty annoying actually! A few times some folk were getting out and carrying over bits but I was being stubborn and tried to stay in my boat. On one rocky rapid my boat tipped against a rock and I slowly capsized, but not totally upside down because it was so shallow, too shallow to be able to try and roll. I got out and took my paddle, walking down the rapid and waiting for Kristian to push my boat over the rocks to where I was. One stupid annoying swim, but never mind! Near the end of the Spean we got to a section with a 6’ drop and all got out to have a look at it. Peter and me looked at it and then at each other and Peter said “no way, no how!” Kate and Kristian were discussing it and I went to listen as I find I learn from hearing folk describe lines to take. To my surprise, Kristian turned to me and said I could do it no bother!! I looked to see if he was kidding but he seemed serious and he went on to say it wasn’t that technical and showed me the line. I headed straight to for my boat, having decided to do it! Kate went first, swearing a bit as she went over and landed it easily, which Peter watched then decided he would do it too. I went next and managed it fine. I was so chuffed I grinned like a fool about it for the rest of the day! Kristian, Peter and Steve all managed fine too, with Liz opting to walk round it. A short paddle on and we had reached the get out. The lack of water had been a bit annoying but the drop made it all worthwhile!! 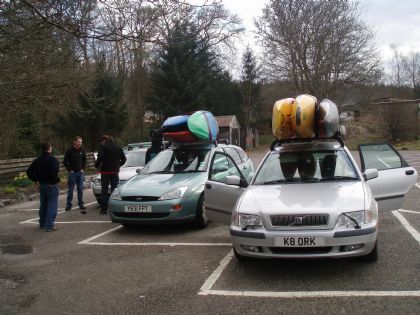 We gathered ourselves together, collected cars, strapped boats on roofs and headed back to Aviemore. After all washing off the river and hanging wet gear in the drying room, we went to an Australian restaurant for dinner then headed to the pub next to the bunkhouse. Peter wasn’t feeling at his best so we cheered him up with a can of peaches. I would try to explain but I think it is one of those occasions when you had to be there!! Liz and Kate headed to bed a bit early while the rest of us waited to be kicked out before headed to our bunks. Sunday morning and most of us were up bright and breezy before our alarms went off again. Steve, I hate to tell you but you snore! Never mind, we had some breakfast, packed up our stuff, checked out of the bunkhouse and heading out into the sunshine again. 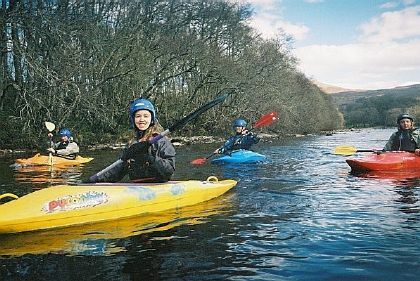 We had decided that we would paddle the upper section of the Findhorn so headed off in that direction. Me and Kate got there first, went and had a look at the grade 4 section above Dulsie Bridge, took the boats off the roof, then Steve and Liz turned up. Ages later Peter and Kristian arrived, apparently after taking the scenic route! Kristian was keen to paddle the grade 4 section, but he was the only person who felt brave enough. We all had a good look at the section of river as Kristian was picking his line and Steve positioned himself with his video camera. Kate got on the water at Dulsie Bridgejust in case any gear needed collecting! Kristian took great delight in borrowing the Pyranha Stretch that Peter had been using, for this section of river. He got on the water a slightly nervous Kristian and set off. By the time he broke into the eddie just round the corner at the top, he looked like he was loving it and made it down the river really well, with only a couple of braces required near the bottom. We all gathered at Dulsie Bridge, the get in for the rest of us, and Kristian reluctantly gave Peter back his boat! This section is mainly grade 3 and had nice rapids, then pools after each one and went round loads of corners. We all did rolls before we set off, not that Peter was keen on getting wet at the start of the river, but I guess he caved to the pressure and joined the rest of us in dampness! Kate led again. I really enjoyed this river and there were loads of wave bits that were bouncy and good fun, almost feeling like the sea! We got to a bit with a technical drop and all carried our boats round. That meant we were getting back in half way down a rapid and then breaking out into the rapid pretty quickly and I don’t feel I am good at that at all! Kate went first and me next. On my first attempt I paddled too timidly and didn’t manage to break out, getting washed back into the rock I was at. I gave myself a stern talking to and tried again, paddling further up into the rapid more positively before turning and I managed it and got into the eddie fine. Not my best bit of paddling and I was silly wobbly but I managed it, we all did. A bit further down the river there was a slightly tricky rapid so we discussed it a bit then Kate went over it, followed by me. I was trying to follow Kate’s line but ended up taking a completely different one, but made it down the rapid the right way up none the less. Steve was next and I just remember seeing his boat vertical on its end then toppling over upside down lengthwise. He swam, so Kate gathered his kit but he was on the other side. Liz came over the rapid next, followed by Kristian then Peter. Kristian came and used his towline to ferry glide Steve’s boat across the river to him and off we set again. The next tricky section was the rooster tail, so we got out to have a look at it as it apparently has a bit of a sticky hole to the left of the rooster tail. Liz decided she didn’t want to paddle this section so her and Steve walked round. Steve positioned himself with a throw line to provide safety for us, and Liz manned the video camera! After being shown the line I just wanted to get back in my boat to paddle it. Kate went first and a few high braces later was at the bottom of the rapid. I went next. Kristian had said to me to make sure I stayed to the right and to paddle positively. I think I followed instruction a bit to well as I just about paddled clean out of the river on the right, but then I just unwedged myself from the rock and got down the rapid fine. Kate was smiling at me then I saw her expression change. When I turned round I saw Peter’s boat coming upside down and him swimming. I collected his paddle while Kate tried to get his boat. There was another rapid just ahead and I didn’t want to go down it with a paddle lying over my deck so I got myself into an eddie. I was feeling all pleased with myself for managing that then looked up to see Kate swimming beside her boat and Peter’s boat, halfway down the next rapid! The rapid turned a corner so I couldn’t see how she was doing. So the situation was that I was sat in an eddie clutching Peter’s paddle, Peter and Kate were both swimming, Steve and Liz were on the river bank out of their boats and I assumed Kristian was somewhere in his boat helping Peter. Bit unsettling really! I wondered if I should follow to try and help Kate but decided I wouldn’t be for much use so stayed put, hoping Kristian would appear shortly! Unbeknown to me, everything was under control though, as just after the next rapid there was a lovely black pool and Kate was on the bank getting back into her boat with Peter’s boat floating gently ahead of her. Kristian came round the corner into the eddie were I was with Peter holding onto the back of his boat and Steve and Liz were getting themselves back in. Peter went on the bank next to me while Kristian headed round the corner to see how Kate was getting on and to collect Peter’s boat. Peter started walking round the river to where his boat was now being pushed up onto the bank and I headed over the rapid, curiously waiting to see what I would find! We all gathered where Peter’s boat was and waited for him to be ready to set off again. It was at this point that I found out that Kristian had capsized on the rooster tail too and had done a one-handed hand roll while holding his paddle with the other hand. I call that just showing off! It does amuse me a bit that the two lasses made it over the rapid the right way up while the two lads both went upside down! There were a few more rapids and then we got to the get out at Ardclach Church. Although that pesky rooster tail created some slightly interesting events (! ), I really enjoyed this paddle. I feel it was a great finish to a fantastic weekend of paddling. We changed out of our paddling gear and said cheerio to Steve and Liz who were heading south again. Then we headed to Inverness before leaving the hired boats with Kate to return on our behalf. I then said a cheerio to Kate, as it would be the last time I would see her before I set off on my travels. Then I hopped in Peter’s car and him and Kristian had to cope with an emotional Kelda for a peedie blink, but I soon came at! It was a nice peedie trip up the road to the boat, with Peter’s excellent driving and good company and banter, which made the journey pass quickly. A peedie boat trip and then the lads dropped me off at the house on their way back to Kirkwall. Fantastic way to spend a weekend if you ask me!